Mike wrote On The Luck Of An Irish Sailor when he was 15 years old, but it wasn't until 50 years later that Mike was encouraged to develop ''Irish Sailor' into a children's book and recording. Author Mike Mirabella spins a wonderful yarn of an Irish sailor with tales from the ocean blue in On The Luck Of An Irish Sailor. Using rhyme, he reveals the story with words that sound like a pirate in an Irish pub. The sailor who speaks like a pirate saw the slap of a mermaid’s tail during a storm. On The Luck Of An Irish Sailor is a wonderful tale of adventure on the high seas. 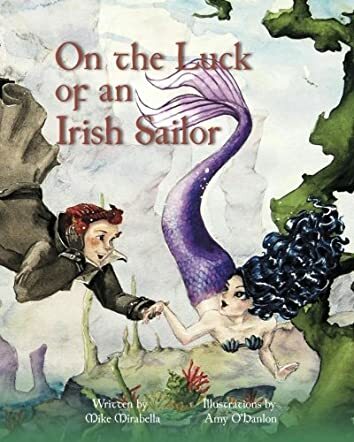 The sailor tells how his ship tipped over during a storm and he was saved by a mermaid and the luck of the Irish. In a story that’s been passed down for generations, author Mike Mirabella takes us on an adventure deep beneath the ocean. Could it really happen? Folklore. That’s the feeling I got as I glanced at the sepia-toned illustrations. In accurate depictions of the story, illustrator Amy O’Hanlon uses hues of blues, greys, and browns to depict the storm. On other pages, she uses beige and brown tones to create the illusion of an older picture book—like a classic story that’s been around for years. On The Luck Of An Irish Sailor is a wonderful story by author Mike Mirabella. This book is bound to be a classic tale treasured by children and adults alike. Readers will be hooked with the first stanza and won’t want to put this page-turner down. This book is highly recommended. There are also Celtic song sheets at the back of the book with music notes so you can sing or play along.